An individual who possessed a personal or family food dish was expected to bring it along to a feast and to use it afterwards to take food home to relatives. The personal food dish, called a kihle, is about 30 cm (12 inches) in length, although smaller ones were made for children. 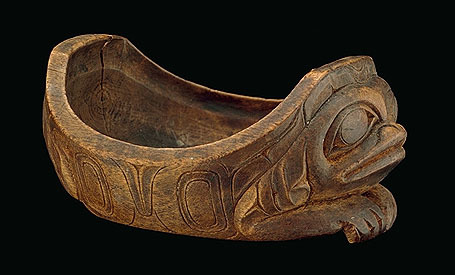 A personal "grease" dish was often carved from a solid block of wood, usually alder, which grows on Haida Gwaii, or maple, which was traded in finished form from the Tsimshian. Bill Holm argues convincingly that the prototype for this sort of dish was originally birchbark, with folded and sewn seams at each corner. This ancient style of carved wooden food bowl, which depicts a Sea Lion in a floating position, is heavily impregnated with grease. The creature's head resembles that of a bear, with prominent ears that are not possessed by sea lions. Acquired on Haida Gwaii in the early nineteenth century by Philip Henry Hind, later in the James Hooper collection, London. In these dishes the head occupies nearly all of the surface of the ends. The eyes are the most conspicuous parts and are indicated by the rounded oblong figures on each side with a black center. Above these are the ear symbols, and below the long narrow space with, usually, a curved line above and a straight one below, is the mouth. At the center of the mouth is generally a wedge shaped mark. If complete, this should have its base joined to the upper lip and the point overhanging the lower one. It is more usual to find this V-shaped mark wanting some of its proper characters than to find a perfect one. It indicates the beak of the bird as seen from full front. A few horizontal markings under the mouth are intended to show the foot. Another kind of dish favoured by the Haida was made of mountain sheep horn that was steamed and bent over a wooden form. The exterior was usually engraved with a complete creature, often a Hawk or Thunderbird. Since sheep horn had to be imported to Haida Gwaii, these are relatively rare in comparison with wooden bowls, and often glow with the patina of long and careful use. This small alder food bowl portraying a Frog was used to serve special condiments such as fermented fish eggs. This piece in the Canadian Museum of Civilization collection is the personal favourite of Haida artist Bill Reid. Collected at Skidegate circa 1900 by Charles F. Newcombe. 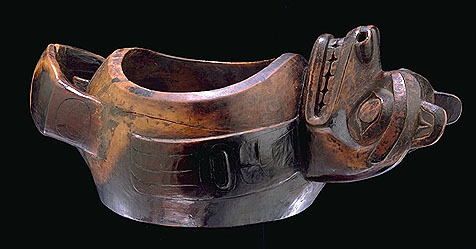 Serving bowls provided by the hosts are the most sculptural of Haida food containers. They are often decorated with human and animal faces and give full expression to the animal forms they emulate. The most common form of zoomorphic bowl is in the shape of a Seal, often shown holding a small human figure in its mouth or under its chin, a gesture that undoubtedly had some mythical significance. Incised formlines delineate the Seal's joints and front flippers. The seal-shaped dish was used to serve seal oil. Other figures such as the Beaver, Sea Otter or even Dragonfly also decorate serving bowls. The rims of these vessels are often embellished with opercula shell or sea otter teeth. Dishes for serving seal or eulachon oil, to judge from their glossy patina, were also frequently made in the shape of canoes. Most are plain, perhaps to emphasize the abstract sculptural form of the canoe, but some have incised designs similar to those painted on actual canoes.